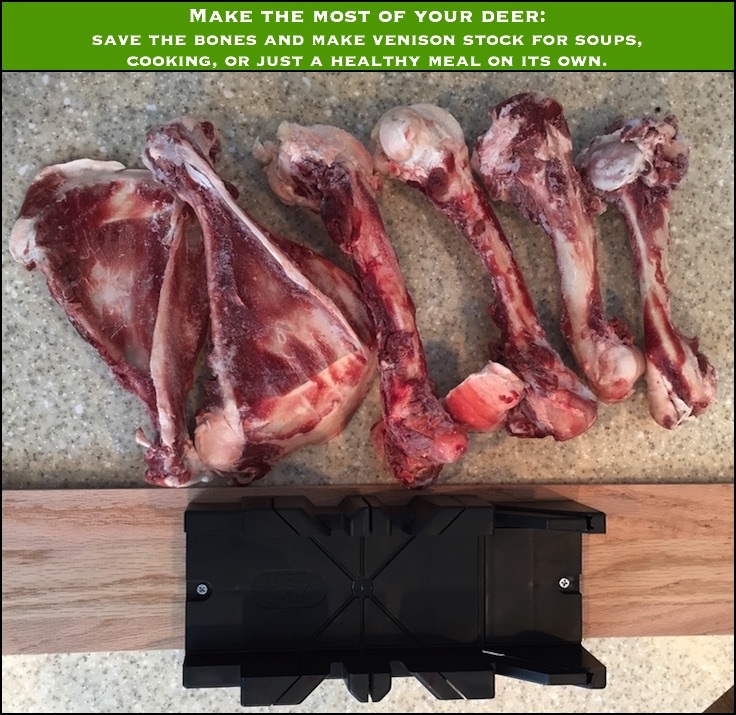 Making your own stock or broth from venison bones ensures that no part of your deer goes to waste – plus, once you’ve made it, you won’t go back to store bought stock. I’ll admit, I get a little obsessive sometimes when it comes to fully utilizing my deer. I hate to see anything go to “waste”. I quote “waste” since technically my wild feathered and furred friends will get anything that I don’t personally use. But still, I get a little angst anytime some part doesn’t make it into my cooler for the trip home. When it comes to the bones, I at LEAST come home with all the leg bones and the ribs. The ribs we’ll cover another time, but the leg bones will be used to make make a hearty venison/vegetable stock that will then get used in many other recipes. When it comes to “waste not, want not”, think of your vegetables too. Adding vegetables to your stock will add a lot of flavor, not to mention nutrients. Sure you can add fresh vegetables, but you don’t end up serving them in the stock. Instead, keep a bag in your freezer, and anytime you are cutting vegetables, add your scraps to the bag. Onion skins and ends, carrot ends and peels, celery ends, garlic skins, and the like are all great additions to stock. Now, do make sure they are clean… and nothing bad or rotted. You’ll be surprised how quickly you can fill a few gallon size freezer bags. Once I finish butchering my deer, I freeze all the leg bones and save them for a cold winter day when I’m ready to make stock. Leaving a little meat on will add some nice flavor. You can use any bones from the deer that you get your hands on. In the picture above, you see the mainstays of my stock: shoulder blade, femur (leg), and humerus (upper arm), which all came home in my quartered deer. You don’t see the shanks here, I save those for a few meals of osso buco over the year. I typically take two deer a year, and these six bones times two deer will make up about 8 quarts of stock give or take. 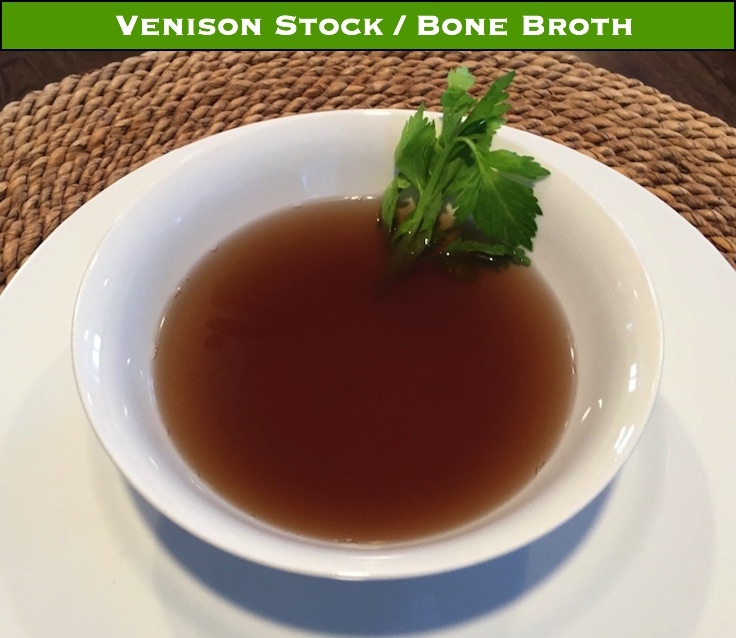 To maximize flavor and nutrients in the stock, cut all of these bones into sections. Halves or thirds is good. A bone saw, hack saw, or even a wood miter saw will make quick work of them. The hard part is holding them steady while you cut them. I’ll use a miter box – more just to brace them, not actually using the guides on the box. I dedicate this set up to my deer processing, so I just clamp it down to my counter to get a clean, secure anchor point I know I can saw with. Plus the miter box is plastic and easy to clean. You DON’T have to cut all the way through. Get about half to three-quarters through, and the bone will easily break by hand. 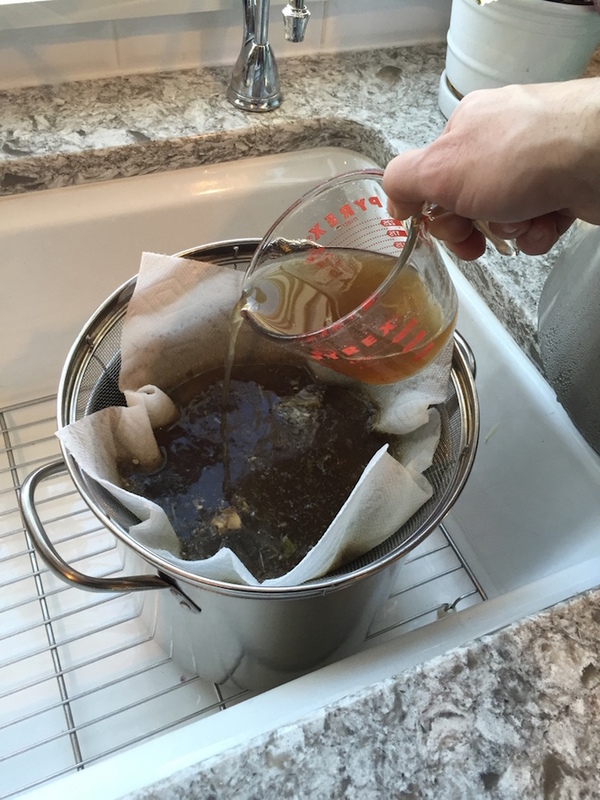 A large metal strainer with a medium stock pot and some cheese cloth or a paper towel makes it easy to filter your stock. To really maximize your stock, you can keep more of the bones – the pelvis, the spine, the neck, etc. 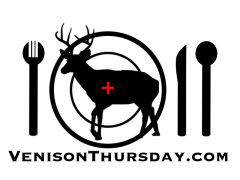 If you are in a CWD area, you should avoid these parts, otherwise, chunk them up and add them in. I don’t like to add the ribs, 1-they have a lot of fat, and 2-I try to avoid using bones that contain areas that were exposed during field dressing (ie: the body cavity). any extra spices you may like: oregano, basil, thyme, rosemary, etc. Preheat your oven to 400°. Arrange the venison bones in a roasting pan, and lightly spray them with olive oil. Roast in the oven for about an hour – this will add flavor and color to your end product. If you have a lot of bones that are overlapping, stir them around occasionally to make sure they are getting evenly roasted. If it gets to the point that the drippings start smoking, your good to take them out. I call that the smoke detector timer. Transfer your roasted bones to a large stock pot. Add cold water to the stock pot till the bones are covered by a few inches. Simmer on the stove for as long as you can stand. You want a nice gentle simmer, don’t get a heavy boil going. Four to five hours is usually a good rule of thumb. Add your vegetables and spices. There’s no magic recipe, if you like a spice, add a tablespoon or two. Just don’t experiment with weird things, a few gallons of anise broth is sure to make people avoid your cooking for a few months. Since you are using vegetable scraps, expect your flavors to be a little different every time, but as long as it’s some combination of the basics: onions, garlic, carrots, and celery, you can be assured you’ll get good results. Simmer everything together for another two hours. At that point, I like to call it a day. Put the pot with everything in it in the fridge, or if outside temps are hovering around freezing, I like to pop it out on the porch overnight. I typically freeze my stock in quart or gallon bags, but I like to freeze at least a quart or two in smaller forms for those recipes that call for just a cup or two of stock. Once it’s cooled (or the next morning), all the fat will have made a solid top over the stock. 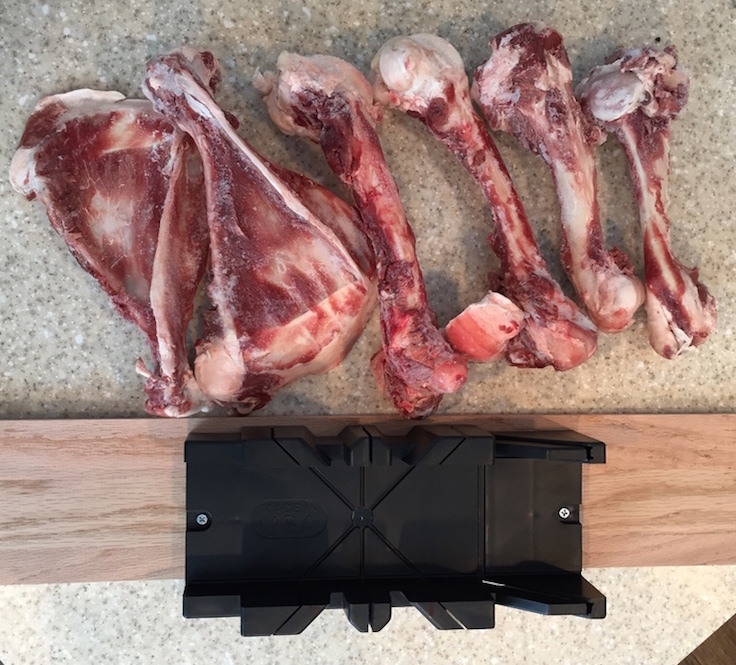 Pull this block off – I like to save it for when I render the fat I pulled off the deer. I can usually make 10 to 15 pounds of bird suet off of the fat from one deer. Use a slotted spoon and a set of tongs, and pull out all the big stuff – vegetables and bones. Run the remaining liquid through either a paper towel or cheesecloth into another stockpot so you are left with just clean filtered liquid. Make sure you squeeze all the juice you can out of your filtering material! Return the liquid to the stove, and bring to a simmer. This is optional – just to reduce it down to the consistency/flavor intensity you want. I’ll usually reduce it down a quart or two. Once it gets to your liking, you can can it, or, I like to freeze mine. Most of it will go in gallon bags, each with a quart of stock in it, into the freezer. 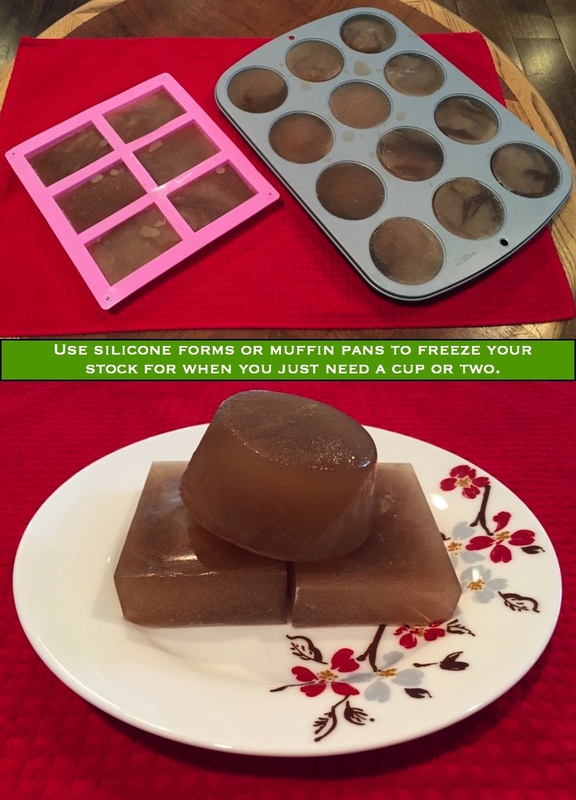 I will freeze some of it up in muffin pans and/or silicone molds for when I need smaller servings. The forms I use easily hold a half cup, so that makes for easy measuring when I just need a cup or two (or less) of stock. 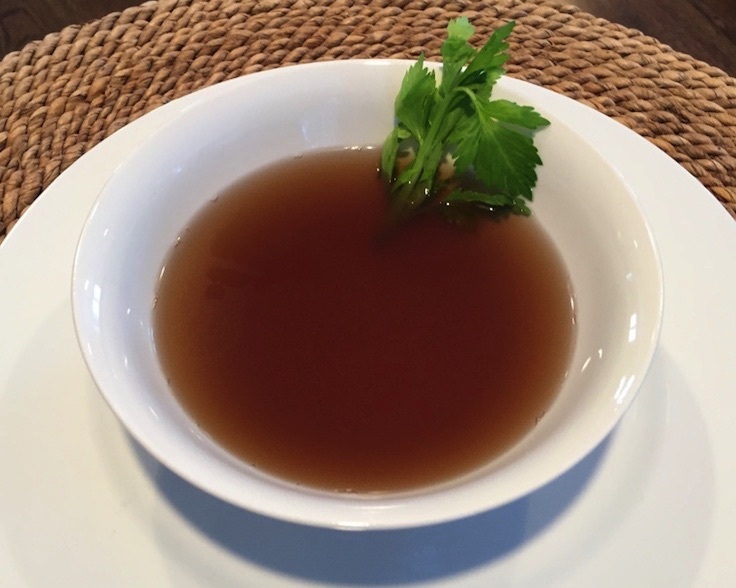 I use this stock in any recipe that calls for stock or broth. It makes awesome soups, and is great to use instead of water for sides like polenta. For a quick lunch, heat up a cup and add some noodles. Or drink it hot and plain. I try to make use of every part of the deer that I can – including the bones. 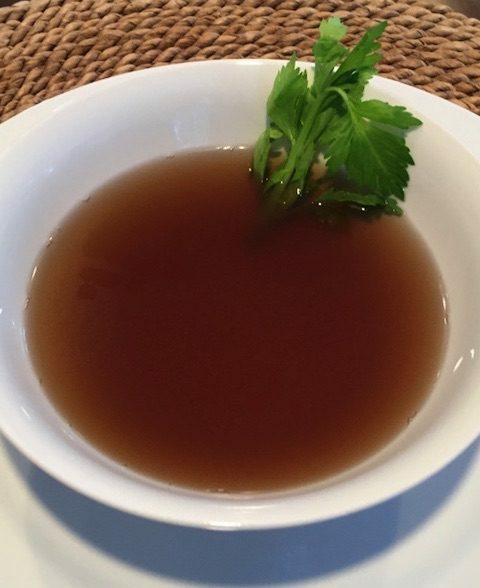 If you haven’t tried making homemade stock, you don’t know what you are missing!